There are clear benefits for both Life Sciences companies and their customers in significantly improving the way they engage. Be it in terms of reputation, efficiency, profitability, or even relationship quality and longevity, engagement has and will always be the key to successful business practice. Recent exclusive research conducted in conjunction with Zephyr Health revealed that both frontline sales forces and sales management professionals want to improve engagement strategies with new technology utilizing predictive insights. However, despite having new tools available to them, sales teams remain heavily reliant on the same techniques that were being used decades ago. So what is the answer – how do Life Sciences companies disrupt this pattern and make significant strides to improve engagement? 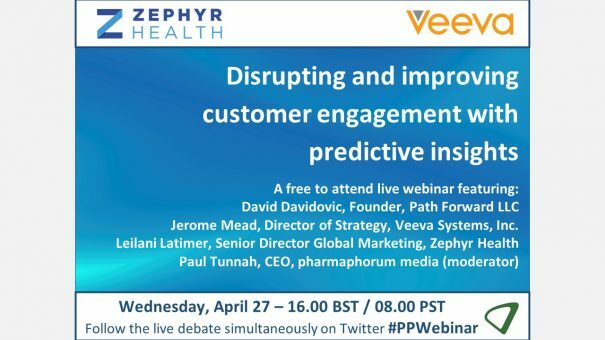 Working with Zephyr Health, we present an expert webinar that will answer this very question, bringing together industry experts to discuss why the disruption is critical, how it can be achieved, and the core role that predictive insights play in this process. As with all of our webcasts, this is an interactive debate designed to enable you to get the answers you need. The live discussion took place on Wednesday, April 27 at 16.00 BST / 08.00 PST. To view the on-demand version, please click here or on the widget below. David Davidovic has been involved in the commercialization of products and in building best-in-class commercial capabilities in the pharmaceutical and biotechnology industries for over 36 years. Most recently, David Davidovic was Vice President and Global Head of Commercial Services for Roche and Genentech. Currently, he heads Path Forward, providing strategic and advisory pro-bono support to non-profit organizations as well as start-ups focused on healthcare. David is based in San Francisco, CA and holds Bachelor of Science and a Masters in Business Administration degrees from McGill University in Montreal, Canada. Jerome Mead, Director of Strategy, Veeva Systems, Inc.
Jerome is responsible for strategy and product marketing for Veeva’s multichannel products, Approved Email, and Engage. Jerome has 15 years’ experience in various consulting, sales, marketing, operations, and marketing innovation roles in pharmaceuticals. Before Veeva, Jerome was the Director of Customer and Capability Strategy at Bristol Myers-Squibb. In that role, Jerome had responsibility for creating new capabilities that would evolve the go-to-market approach for all of BMS’s US brands. He has deep experience in multiple disease areas and has been fortunate to hold roles in all aspects of sales and marketing across multiple disease areas. Jerome received his B.A. in Mathematics from LaSalle University. Leilani Latimer is Senior Director of Global Marketing for Zephyr Health, the Insights-as-a-Service leader harnessing the power of global healthcare data to address critical business and patient needs. She leads the strategy, planning, and execution of the company’s global marketing efforts including integrated marketing campaigns, demand generation, event marketing, PR and external communications, product marketing and marketing operations.